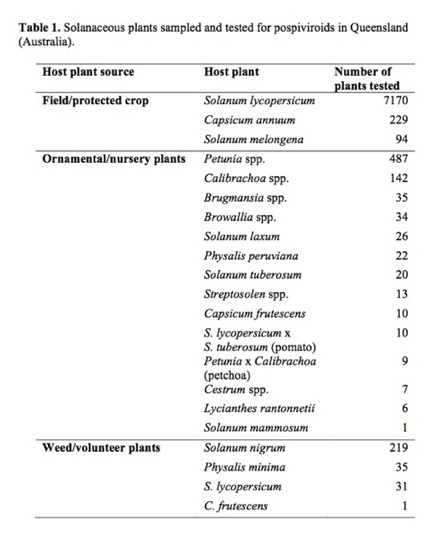 First report of pospiviroids infecting ornamental plants in Australia: Potato spindle tuber viroid in Solanum laxum (synonym S. jasminoides) and Citrus exocortis viroid in Petunia spp. Pospiviroids, including the quarantine regulated Potato spindle tuber viroid (PSTVd), have recently been shown to cause symptomless infections of various ornamental plant species in Europe (Verhoeven et al., 2010, Verhoeven et al., 2012). These findings have drawn attention to the potential role of these host plants as sources of infection for commercially important crops including tomato, sweet pepper, potato and citrus. In order to investigate the viroid status of a variety of solanaceous crops, ornamental plants and weed hosts in Australia, a national survey was conducted during 2012. Here we report survey findings from the state of Queensland, where sampling was conducted between June to September 2012. A total of 8601 symptomless plants were sampled, collected from 25 open-field and protected plant production and nursery facilities located across the state, including weeds and volunteer plants collected on-site or nearby these facilities (Table 1). One young leaf was sampled per plant, and a single leaf disc was then subsampled from each leaf using a sterile disposable biopsy punch (diameter 4 mm). A maximum of 100 tomato leaf samples, and up to 10 leaf samples of any other single plant species, were bulked prior to subsampling and nucleic acid extraction. This bulking strategy, in conjunction with our specific diagnostic methodology, was evaluated and verified by simulating the detection of one infected plant in a background of uninfected plants (at the prescribed rates), to limit the potential of false negative results (data not shown). RNA was extracted from approximately 350 mg of leaf tissue per bulked sample using a TissueLyser bead mill (QIAGEN) and Biosprint 15 DNA Plant Kit (QIAGEN). All samples were tested for pospiviroids using two-step reverse-transcription (RT)-PCR utilising the primers Pospi1-FW/RE (Verhoeven et al., 2004), which amplify several (but not all) pospiviroid species and strains. Four samples produced amplicons of the expected size (approximately 196 bp), which were directly sequenced. Sequence analysis indicated the presence of Potato spindle tuber viroid (PSTVd) in one bulked sample of Solanum laxum (synonym S. jasminoides; white potato vine) and Citrus exocortis viroid (CEVd) in two separate bulked samples of Petunia spp. and one bulked sample of petchoa (Petunia x Calibrachoa). These findings were further confirmed by sequence analysis of RT-PCR amplicons produced utilising primers Pospi1-FW/RE from a new extraction of a duplicate sample. Further RT-PCR analyses were performed using primers PSTVd-F/R (Shamloul et al., 1997) and CEVd-specific-S/AS (Semancik et al., 1993) to generate full-length genome sequences, which were submitted to GenBank with Accession Nos. KC282384 (PSTVd), KC282382 (CEVd, Petunia), KC282383 (CEVd, Petunia), and KC282381(CEVd, petchoa). To our knowledge, this is the first report of pospiviroids infecting ornamental plants in Australia, and the first report of CEVd naturally infecting Petunia spp. These findings suggest that ornamental plants may pose a phytosanitary risk and entry pathway for the introduction and spread of pospiviroid infections to commercially important crops such as tomato and citrus, in Australia. The authors thank Biosecurity Queensland personnel for the provision of samples. Semancik JS, Szychowski JA, Rakowski AG, Symons RH, 1993. Isolates of Citrus exocortis viroid recovered by host and tissue selection. Journal of General Virology 74, 2427-2436.